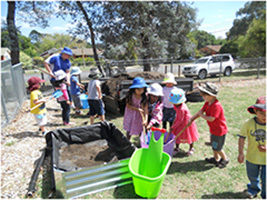 The Early Years Learning Framework enables Mawson Primary School’s early childhood educators within the preschool settings to extend and enrich children's learning, provide opportunities for children to develop a foundation for learning and for children to become successful learners. Within the Early Years Learning Framework there are three basic concepts that characterise children’s lives - Belonging, Being and Becoming. This refers to how a child is linked to family, community, culture and place. Through relationships a child's development and learning takes place. They begin to explore, develop interests, create their own identity and make meaning of the world around them. The three concepts, Belonging, Being & Becoming, represent life and living and are constantly referred to throughout the EYLF. The EYLF learning outcomes are goals which can be achieved by a child during their learning. The outcomes and sub outcomes cover a variety of areas which include identity, community, wellbeing, learning and communication. Children feel safe, secure, and supported. Children develop their emerging autonomy, inter-dependence, resilience and sense of agency. Children develop knowledgeable and confident self identities. Children develop a sense of belonging to groups and communities and an understanding of the reciprocal rights and responsibilities necessary for active community participation. Children respond to diversity with respect. Children become strong in their social and emotional wellbeing. Children take increasing responsibility for their own health and physical wellbeing. Children develop a range of skills and processes such as problem solving, inquiry, experimentation, hypothesising, researching and investigating. Children transfer and adapt what they have learned from one context to another. Children resource their own learning through connecting with people, place, technologies and natural and processed materials. Children interact verbally and non-verbally with others for a range of purposes. Children engage with a range of texts and gain meaning from these texts. Children express ideas and make meaning using a range of media. Children begin to understand how symbols and pattern systems work. Mawson Preschool currently operates full time with three groups. Children attend for 30 hours each fortnight. The preschool has two qualified early childhood teachers and two preschool assistants. The sessions are: 8.45am-2.45pm Monday, Tuesday and alternate Wednesdays 8.45am-2.45pm Thursday, Friday and alternate Wednesdays. Children at Mawson Preschool will be nurtured and secure in the relationships they form with staff, parents and other children when they attend for their preschool year. Enrolment for preschool is available from Term 2 of each school year for the following year. Children are eligible to attend in the year they turn 4 up to 30 April of that year. Enquiries about enrolment procedures can be made by contacting Mawson Primary on 6205 8033 or directly to the preschool teacher to answer any queries on 6205 6666.